A host of governors pledged yesterday to intensify their efforts to address climate change regardless of President Trump's ultimate decision over the Paris Agreement. The proclamations, made mostly by Democrats, were not a surprise in and of themselves. They nevertheless illustrated the evolution of U.S. climate efforts, as policymakers in green-tinged state capitals assume the responsibility for driving deep reductions in carbon emissions. State leaders were unsparing in their criticism of Trump, who was widely reported to be on the verge of pulling out of the carbon-cutting agreement yesterday. Yet many framed their responses in terms of everyday decisionmaking. Washington Gov. Jay Inslee (D) said his efforts to promote a carbon tax were more dependent on budget negotiations than the president's decision on Paris. In Colorado, a purple state boasting coal mines, oil fields and a growing renewable industry, Democratic Gov. John Hickenlooper pledged to continue working with utilities to lower emissions while reaching out to Republican colleagues in other states to find ways to green the economy. And in California, where Gov. Jerry Brown (D) is preparing for a trip to China next week to hold a series of high-level meetings on climate change and clean energy, the state Senate passed a bill yesterday to receive all its energy from renewable and zero-carbon sources by 2045. "America's gone AWOL under Trump," Brown told E&E News yesterday. "Ironically, Trump, by his actions, is giving climate denial a very bad name, making it utterly implausible. And that is actually building the energy and strength of the contrary movement, which is climate activism and efforts by countries, states and provinces to do the right thing to get our economy aligned with a decarbonized future." Inslee also lamented what he called a step back for the United States on the world stage. But he was quick to point to an executive order he signed last year aimed at reducing greenhouse gas emissions to 25 percent of 1990 levels by 2035. "We've made it illegal to put pollution in the air," he said. Can the markets 'deliver' what Trump won't? Such pledges at once demonstrated the potential and limitations of state climate action. Energy policy has long been the domain of the states, particularly as it relates to the power sector where regulators hold broad sway. New York, under Gov. Andrew Cuomo (D), has committed to revamping the Empire State's electric grid with clean energy. The Colorado Public Utilities Commission recently directed Xcel Energy Inc., a utility, to calculate the environmental and health impacts of carbon in its long-term plans. And Massachusetts, Connecticut and Rhode Island all boast legally binding emission caps, calling for an 80 percent reduction in carbon levels by midcentury. Even in Republican-dominated states, low natural gas prices and corporate procurements of renewable energy are driving coal out of the power sector, said Amy Myers Jaffe, executive director for energy and sustainability at the University of California, Davis. Trump's decision on Paris will do little to alter those trends, she said. "I personally think the market itself will deliver what we committed to without much intervention," Myers Jaffe said. "There are very few states that aren't going in the direction of energy efficiency and renewables." At the same time, states cannot be expected to marshal an international effort to tackle a global problem, said Jason Bordoff, a Columbia University professor and former climate adviser to President Obama. "A ton of CO2 has the same impact no matter where it comes from," Bordoff said. "I think states can make a big dent in the carbon management problem. But eventually you don't succeed in decarbonizing the economy overall without national and international leadership that's up to the scale of the challenge." Ultimately, the success of state action will likely hinge on local leaders' ability to bridge differences at home and with their neighbors. Greens face challenges even in climate-conscious states like Washington. 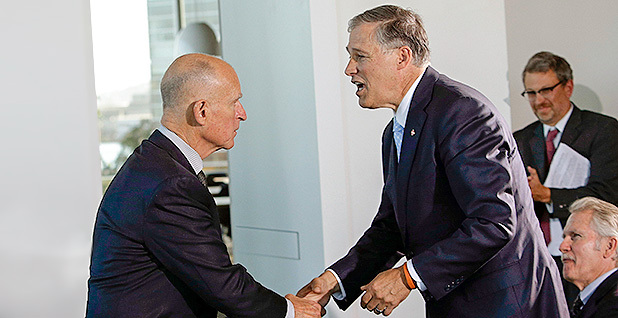 Inslee's carbon cap has been challenged in court, and the governor has thus far had little success in enticing Senate Republicans who control the upper chamber in Olympia to support his carbon tax proposal. Washington voters last year widely rejected a carbon tax at the polls. Inslee remains undaunted, arguing that Trump's decision on Paris only reinforces the need for state action. Even if the United States remains part of the climate pact, the agreement will be rendered meaningless by the president's decision to dismantle the policies, he said. "Remember Martin Luther King: 'The arc of the moral universe is long and bends towards justice.' People forget the part about it's long. This is a long effort," Inslee said in an interview yesterday. "We have a temporary president. We have the ability to move forward every single day. Every state, every city, every county, every business. And if there's some silver lining to this, it's a wake-up call we're the game in town now. It's us. This is a starting pistol for us in the race." Boosting collaboration among states is perhaps just as important. While Northeastern states have succeeded at reducing carbon emissions by 37 percent since 2008 through the help of the Regional Greenhouse Gas Initiative, a cap-and-trade pact, finding consensus for similar programs in regions like the Rocky Mountains is harder, Hickenlooper said. The Colorado governor nevertheless expressed optimism that agreement could be struck with his Republican counterparts from neighboring states, especially on issues like promoting renewable energy and clean air, which have broad bipartisan support. He pointed to Colorado's partnership with Utah and Nevada as an example. The three states have agreed to an electric vehicle corridor, with charging stations installed every 50 miles along their interstates. Democratic officeholders were not the only ones to criticize the president, though Republicans were far more muted in their barbs. Massachusetts Gov. Charlie Baker, among the most outspoken Republicans on climate, said in a statement that "a decision by the Trump-Pence Administration to not maintain the United States' commitment to the Paris Climate Agreement would be disappointing and counterproductive to the efforts and progress Massachusetts and other states have made to reduce carbon emissions." A spokeswoman for Vermont Gov. Phil Scott (R), who recently penned a letter with Baker calling on Trump to stay in the Paris accord, did not respond to multiple requests for comment. The leaders of America's largest states, by contrast, pledged action. New York has already taken some of the most significant actions to address climate change. Through its Reforming the Energy Vision plan, the Cuomo administration has worked at transforming its energy grid for years, to increase its share of renewable energy and to make it more efficient. The state has a $5 billion pot of money to incentivize solar, wind and other forms of clean energy and to make the grid more efficient. It is also using that money to support nuclear facilities on the verge of shutting down, because they are sources of carbon-free energy. The state is helping develop what could be one of the country's largest wind farms off Long Island and has given hundreds of millions of dollars to help Tesla Inc. build the largest solar panel factory in the Western Hemisphere near Buffalo. Still, it's not clear whether New York will do anything differently when it comes to addressing climate change if the United States drops out of Paris. New York officials did not offer their reaction yesterday. However, Cuomo tweeted that the state had already experienced the ravages of climate change, largely through rising seas. Cuomo's Twitter account did not attack Trump directly, something he routinely avoids, but criticized the "federal government" for failing to act on climate. 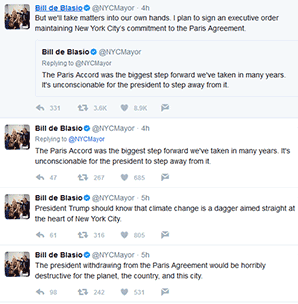 "If Washington won't act, New Yorkers will," he wrote on Twitter. "We've set bold renewable energy goals and will invest in a sustainable future. "Climate change is real and won't be wished away by denial," he tweeted. No state has gone further, however, than California. The Golden State has rushed to fill the climate vacuum created by Obama's departure in Washington. The state Senate passed S.B. 100 yesterday, which would increase the renewable portfolio standard to 100 percent by 2045. On Tuesday, it approved a separate bill that would preserve Obama-era versions of the Clean Air Act, Clean Water Act and Endangered Species Act as the federal backstops to state enforcement authority. California also pioneered the country's vehicle emission standards and has joined a cap-and-trade pact with Quebec. Still, California can only do so much, Brown said. "The complexity and scope of climate issues calls out for federal leadership and federal rules and laws," the governor said. "It can't make up for it, but California and other states and other countries can hold the line and advance the ball while we suffer this interregnum of climate denial."